In a dingy part of Manila in 1995, two men were mixing chemicals in an apartment building. Murad and his friend Ramzi had some prior knowledge of chemistry, having dabbled for the previous two years. However, they weren’t prepared for what happened next. A fire broke out and the pair had to quickly flee, leaving their belongings behind. As the two ran to safety, Ramzi told Murad he had to go back and get his laptop, which he’d abandoned during the confusion. As he arrived at the apartment, he found police swarming the a building. He tried to give a fake name so as to avoid arousing suspicion, but police arrested him. He offered Aida Fariscal, the police chief on the scene $2,000 US dollars if he’d let him go – more than a year’s salary. Fariscal thought this suspicious and decided to hand him over to the Philippine National Police. While exploring the apartment where the fire broke out, Aida discovered something unusual. On one of the tables sat a battery, some cables and a Casio F-91W watch. The watch had been a favourite among young Filipinnos for years, but Fariscal had never seen one quite like this. Further analysis would discover that Murad, real name Abdul Hakim Ali Hashim Murad was using the watch as a timer for a bomb that he planned to use to kill Pope John Paul II on a scheduled visit to the Philippines later that year. The plot gave a glimpse at how terrorists were using one of the most ubiquitous time pieces to commit some of the world’s most heinous acts, transforming the Casio F-91W from functional wristwatch to silent killer. Upon its release in 1991, Casio’s simple watch featured an LCD screen, three buttons, a stop watch, calendar and a battery life that could last up to seven years. It was also accurate to within 30 seconds a month, and just six minutes per year. 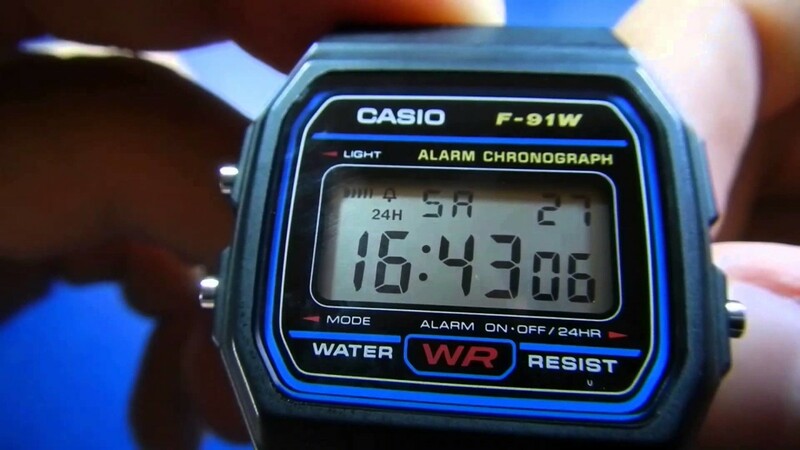 Upon its release, Casio sold the F-91W for less than $20 making it one of the world’s first mass-produced digital watches to be affordable for just about everyone. It has been described as a “modest masterpiece” and has been worn by everyone from hipsters to President Obama. Even today, Casio reportedly produces three million of the watches every year. But its utility and ubiquity meant, somewhat inevitably, it caught the eye of bomb-makers looking for new ways to plant devices without having to be physically near them to set them off. With little more than a circuit board, some 9-volt batteries and a bottle of contact lens solution filled with nitroglycerin – a drug used to lower blood pressure – you could plant a bomb small enough to fit in a brown paper bag but big enough to bring down a plane. In 1994, Ramzi Yousef used a Casio watch to blow-up Philippine Airlines flight 434. Luckily the explosion didn’t destroy the plane, allowing it to be safely landed in Japan. However, the watch proved to be brutally effective at remotely detonating bombs. A newly emerging terrorist group by the name of Al Qaida began handing them out at training camps across Pakistan, including Murad who would test the device on a packed theatre in Manila in 1994. Thanks to its availability in nearly every electronics shop, they are easy to obtain, and so widely available, they could be bought en-masse and transported to remote camps without raising suspicion. However, after 9/11, investigators at Guantanamo Bay started to notice a strange pattern. Osama Bin Laden was also spotted wearing the watch, making it the only branded item he ever wore while in public. Al-Qaida were the original users of the watch, its popularity among bomb-makers has spread. A few months later in August of this year, on August 17, an explosion ripped through tourists at the popular Erawan Shrine in Bangkok, killing at least 20 and injuring over 120. Investigations into the identities of those responsible led the Thai police to an apartment in the city’s eastern suburbs. What they discovered apart from explosive materials and wiring, were four wristwatches, all of which were Casio F-91Ws, according to the Bangkok Post. But despite all this negative attention, the F-91W continues to endure. It has also found a less deadly form of expression. Last month, design duo Dexter Sinister used the humble F-91W to highlight how humanity has coded objects to tell the time. The Casio watch has now become a form of artistic expression. And it’s precisely this unassuming versatility that will help the Casio F-91W continue to be a fashion accessory – and calling card for hipsters and terrorists alike. It’s simple, unassuming and reliable. It’s a statement of cool detachment and a brilliant way of blowing up explosives. In an age where technology continues to eat itself, and irony has found its way into the hearts and minds of the fashion conscious, the F-91W does that most rare of things: be notorious for good and bad reasons.